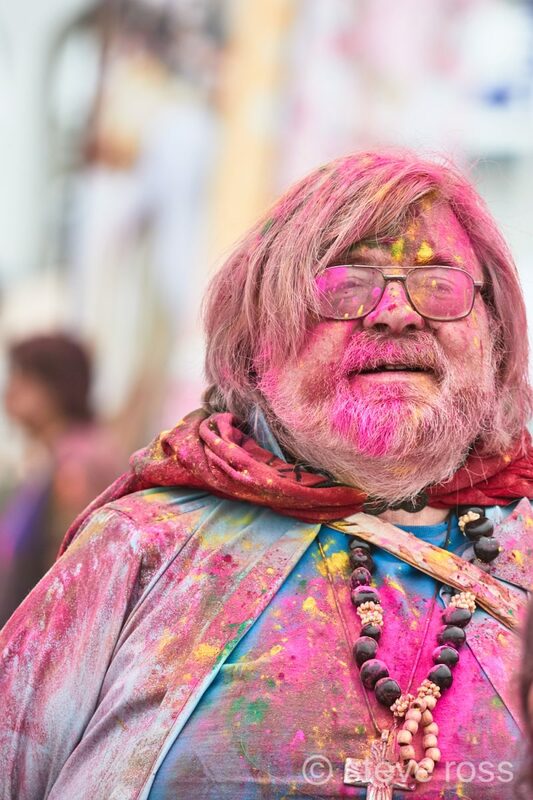 On May 6th, 2017, the popular Festival of Colors will be held in the amphitheater next to the Oceanside Pier. Park in the pay lot or on the street. Admission is $5 online here. The cost is a bit more the day of the event. First and foremost, prepare to protect your gear. 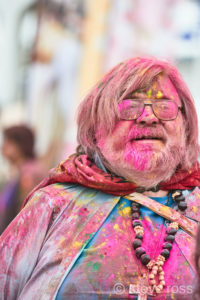 The pigment involved in this festival is a powdered chalk-like substance and it carries on the breeze. There is no avoiding it, but you can take precautions. 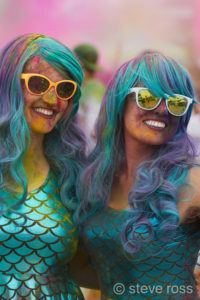 While you’re at it, dress in something you won’t mind getting messy with the pigment that will be in the air. Recommendation: Bring one camera and one lens. You want to be unobtrusive and because it is so dusty with pigment, you do not want to change lenses. In the past I have shot this with a Fuji X-T1 with an 18-55mm (24-70mm FF equivalent) and with a Canon 7DII with a 70-200mm (105-300mm FF equivalent). Don’t bring a camera bag you care about unless you plan to have pigment on it at the end of the day. Carry extra batteries in your pockets. Put a UV filter on your lens for protection. Bring a plastic rain-protectant bag for your camera that ties around the lens and protects it from the colored pigment. A small waste paper bag also works. Also, bring some microfiber rags to periodically clean the filter. Keep them in your pockets. Before you start, note the direction of the wind. This is crucial as the pigment will be flying and you will be happier if you are not downwind. Also note the sun direction and project which way it will move. The ideal conditions are overcast, but you can work with anything so long as you stay away from harsh shadows. They will be in a roped off area so as to reduce the amount of pigment that spills over onto the rest of the grounds. You can shoot from outside the roped off area, and there will be plenty of people near the ropes. But… if you want to really get in the spirit of the event, wade right on in. Shooting people sitting in the bleachers gives you a distracting background of horizontal lines formed by the seats and backs. These people are enjoy being seen, and thus being photographed. 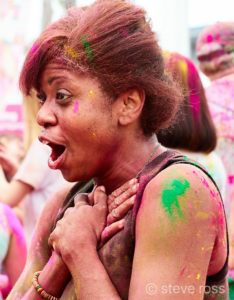 Nobody who goes out and deliberately throws pigment at other people, only to get a face full of it themselves is shy. They want to be photographed. Just do it. Talk to them. Exchange Facebook info. Friend them on the spot and follow up with images so they can enjoy your images of them. They are literally all friendly. It’s a love-fest. You cannot possibly go wrong. This is a mob scene. Pointing your camera into a crowd and shooting will be less fulfilling than deciding on a person or small group and isolating them. How? Either wait until they separate a bit or use selective focus (longer focal length, wider aperture). As an example, I shot last year’s festival at f/2.8 the whole time with that 70-200mm). Don’t use your high frame advance mode. This is a personal recommendation. Remember that there is another person at the other end of this relationship, not a bird or motorcycle. They may shy away from a big camera that sounds like an automatic weapon. Always show respect for the participants. In the unlikely event that someone says no, or puts his or her hand in front of their face, move on. There are plenty of other people in the crowd. Also, don’t be that “jerk photographer” who is bouncing around everywhere and who winds up in everyone else’s images. Again, be respectful — it’s an event for everyone. Look for details. Dogs, hand prints, pigment in hair, all the small stuff. The wider view can be distracting. 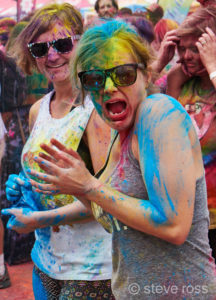 There is a “color throw” every hour. That is when everyone throws pigment into the air. They have a countdown, so it will not be a surprise to you. I recommend you not be in the mosh pit when this happens. This is a great overview shot. Summary: 1) Make eye contact with your subject, 2) Shoot an appropriate number of frames, they aren’t paid models; 3) Offer to exchange information so you can share your work with them. Clean the outside of your camera with canned air so the pigment isn’t rubbed into the surfaces of the camera. Then, carefully clean all the rest of your camera as you normally would.